The announcement of the conference venue, which was made by the UN on October 14, 2011, falls during a new high peak in the on-going Arab Spring in several countries, mainly Tunisia, Egypt and Libya, and the continuing bitter popular uprisings against dictatorial regimes in Yemen and Syria, among others. The decision also coincides with a strong, increasing wave of popular protests in some key Arab countries against Israel – the sole country in the region to have nuclear weapons, estimated at 210 and 250 atomic warheads. This number is equivalent to more than double of the combined atomic arsenals of India and Pakistan. These popular protests reached their zenith in Cairo in late August and early September this year, with the assault on the Israeli embassy and the burning of the Israeli flags. Other protests took place in Tunisia, Jordan and Morocco. Meanwhile, Israel has also been witnessing a massive popular movement against the social policies, high food and services costs and unemployment rates of its current, far-right government chaired by Prime Minister Benjamin Netanyahu. Then came the Palestinian Authority's bid at the UN General Assembly in September, for a full recognition of Palestine as an independent, sovereign State as supported by the UN General Assembly umpteen times. The move led to more tensions in the region in view of the adamant and open rejection by both Israel and the U.S. which decided to veto it. "All these tensions will hardly help facilitate the Finnish task to advance on the road of freeing the Middle East from nuclear weapons," a retired Egyptian nuclear expert told this journalist on condition of anonymity. “There is now a new scenario in the region. The emerging democratic systems in key countries like Egypt and hopefully soon also in Syria, should not be expected to listen to their 'Master's Voice' – the U.S, as the falling dictatorial regimes have been doing for long decades," added the expert who actively participated in the preparations for the 1995, 2000, 2005 and 2010 conferences to review the (Nuclear) Non-Proliferation Treaty (NPT). The turbulent, oil-rich, awakening Middle East is the sole key region that is not free from atomic weapons. Other regions, including entire continents, have already done so. Such is the case of Latin America and the Caribbean; the South Pacific; South-East Asia; Central Asia; and Africa. The task before Jaakko Laajava, under-secretary of State in Finland's foreign ministry, who has been appointed as facilitator of the conference expected to take place "broadly in 2012", appears to be anything but easy. The launch of an international Middle East conference was decided by the May 3-28, 2010 NPT Review conference in New York, following persistent pressures by Egypt – the original author of the Middle East nuclear free zone initiative since late 60s – with the backing of Arab countries, Turkey, and the Non-Aligned Movement, as well as some European nations, mostly Scandinavians. In run-up to the NPT review meeting, Egyptian diplomats reiterated in different fora the more than 40-year old demand that the long-troubled Middle East region must be freed of atomic arsenal and all weapons of mass destruction. The Cairo initiative, first launched in1961, has been assuming contours over the past four decades, and as Cairo officials have reiterated, all Egyptian governments have been relentlessly sticking to their "clear and totally transparent position" towards nuclear weapons and in general all weapons of mass destruction (atomic, biological and chemicals). Knowledgeable sources assure that Cairo policy still holds ground. Egypt submitted to all parties involved in the New York 2010 NPT Review conference, a working paper through which it called on the meeting to express "regret that no progress has been achieved for the implementation of the 1995 (UN) resolution," which confirmed previous resolutions to free the region from nuclear weapons. That resolution established a solid base for negotiating the elimination of nuclear and other weapons of mass destruction in the Middle East, declaring it a nuclear-free-zone. Only days before the New York meeting, an Egyptian Foreign Affairs ministry spokesperson pointed out on April 26, 2010 that Caio has always been working for achieving the goal of a nuclear weapon free Middle East through international fora and groups of countries that "share our thinking, in particular Arab and African countries and also some European states." The Egyptian Foreign Affairs ministry called on "all States to join the Nuclear Non-Proliferation Treaty," fully aware that Israel is the only country in the region to reject the Treaty. A spokesperson said that, through its participation in the 2010 Review conference, "Egypt wants to ensure the accession of all States to this NPT." He stressed that "the non-accession by Israel to the NPT not only jeopardises security and peace in the region, but also makes them unviable." The Cairo document urged the NPT Review meeting in New York to organise a UN conference by 2011 with the participation of all countries in the region to work out a formal accord ensuring their effective commitment to free the Middle East from nuclear arms. Cairo called for such a conference to be organised under the UN flag, so as to ensure that its decisions would be legally binding. Instead, the 2010 Review meeting decided to hold an "international conference" with non-binding recommendations. This is an indication that the WMD-free Middle East conference in Finland in 2012 will produce at best a "toothless baby tiger," as an Asian diplomat confided to this journalist on condition of anonymity. Backed by a large number of European countries and firmly supported by the U.S., Israel sticks to its decision not disclose its nuclear arsenal to any international body. It insists on keeping its military nuclear programme strictly confidential, while systematically refusing to join the Non Proliferation Treaty. As a way to confirm Tel Aviv's stand not to facilitate attempts to free the Middle East from weapons of mass destruction, Israeli Prime Minister Benjamin Netanyahu refused to participate in the Nuclear Security Summit which was organised by U.S. President Barack Obama in Washington on April 13-14, 2010. Netanyahu also deserted the NPT Review conference in May last year in New York. Egypt's perspective of the cornerstone of a WMD-free Middle East zone was spelt out by the Egypt State Information Service (SIS) in an official paper disseminated one week ahead of the NPT Review conference. The document stated: "Egyptian vision for achieving peace and stability in the (Middle East) region is based on fundamental principles such as a fair, just solution of the Palestinian cause and the integral implementation of all resolutions based on international legitimacy." 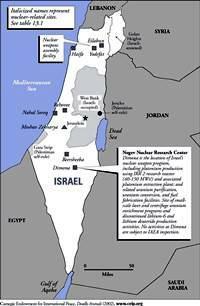 - The lack of "any positive step" by Israel towards freeing the region of nukes as well as its position based on the 'military superiority doctrine', will only contribute to aggravating regional insecurity. In calling for total elimination of all kinds of weapons of mass destruction in the region, Egypt rejects any sort of discrimination or 'partialisation' that might be imposed by one party upon another in the Middle East. Egypt rejects any possible 'selectiveness' of any weapon or any country, and rejects any concession of any special status to any country in the region. The process of disarming the Middle East of all kinds of weapons of mass destruction must be carried out under international and comprehensive supervision, in particular by the United Nations and its agencies. Egypt demands the implementation of several UN resolutions calling for freeing the Middle East from nuclear weapons, in particular the UN Security Council resolution number 487 adopted in 1981. Far ahead of the NPT review conference, Cairo had rejected the U.S. offer to guarantee defence of the region against atomic weapons as part of a comprehensive Middle East peace plan. This offer amounting to a nuclear umbrella is reported to have been made by President Barrack Obama's predecessor, George W. Bush. Nuclear umbrella is usually used for the security alliances of the U.S. with non-nuclear states such as Japan, South Korea, much of Europe, Turkey, Canada, and Australia, originating with the Cold War with the then Soviet Union. For some countries it was an alternative to acquiring nuclear weapons themselves. In fact, on August 18, 2009, during his first visit to Washington in five years, Egypt's deposed president Hosni Mubarak insisted that "what the Middle East needs is peace, security, stability and development", not nuclear weapons. Egypt reaffirmed its pledge underlying the country's commitment for the establishment of a "nuclear free Middle East". Pre-empting discussion on the issue, Mubarak said in an exclusive interview with the leading official Egyptian daily Al Ahram on August 17, 2009: "Egypt will not be part of any American nuclear umbrella intended to protect the Gulf countries". He asserted that “the Middle East does not need any nuclear powers, be they Iran or Israel -- what we need is peace, security, stability and development". In any case, "we have not received any official communication regarding such a proposal", he added. On the same day, Ambassador Suleiman Awad, spokesperson of the Egyptian Presidency, also commented on a U.S. nuclear umbrella in the region. "This is not the first time the issue is raised; it is part of the U.S. defence policy," he said. Commenting alleged U.S. nuclear plans in the Middle East, Awad said: "It is absolutely unacceptable both in form and contents. Instead of talking about a nuclear umbrella, the Iranian nuclear file should be dealt with (in a spirit of) dialogue and flexibility from both sides, the West and Iran." "Iran has the right to benefit from the peaceful uses of nuclear energy, like any other country signatory of the Non-Proliferation Treaty, provided that it proves that its programme is for peaceful uses," the spokesperson said. In view of all the above, the road toward the announcement of a Middle East conference in Finland has been littered with obstacles, as no country was willing to host it and no one was ready to act as a facilitator. Will Finland achieve what the others failed to do during many long decades?